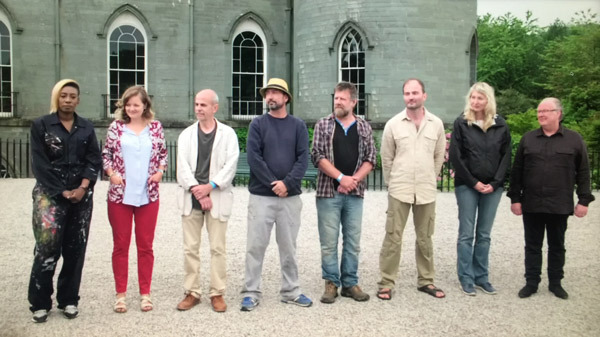 Episode 6 of the Heats for Sky Arts Landscape Artist of the Year was at Inveraray Castle in Scotland. This is the last heat - after this there are only three more episodes left! The location was lovely - on the estate of a very attractive Castle with views from the grounds of the landscape round about. 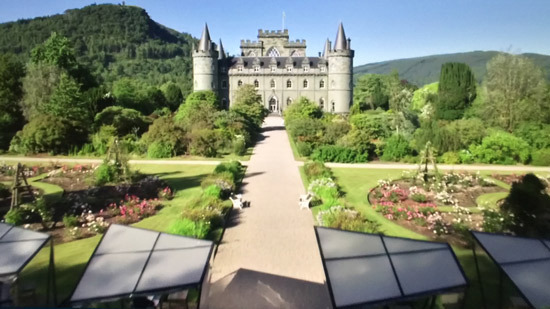 Inveraray Castle is is the ancestral home of the Duke of Argyll, Chief of the Clan Campbell. 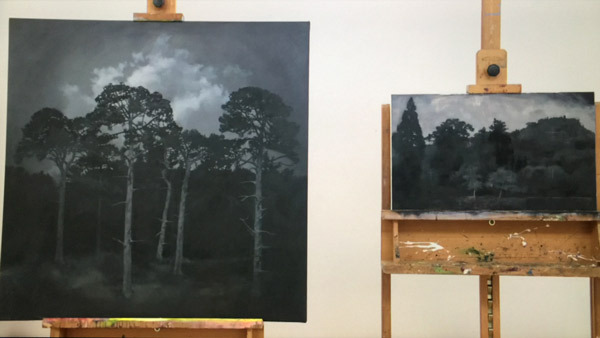 It's found near Inveraray in the county of Argyll, in western Scotland, on the shore of Scotland’s longest sea loch Loch Fyne, the venue for the heat which aired as Episode 3 of the Landscape Artist of the Year 2018 series. The castle is one of the earliest examples of Gothic Revival architecture. It was also the chosen location for the Downton Abbey Christmas 2012 episode. Dawn Beckles [Facebook/Twitter/Instagram] - A mixed media artist specialising in painting, collage and printing. She paints still lives involving exotic flora as a recurrent subject matter i.e. not a landscape artist at all! Describes herself as currently a Londoner by ways of Barbados and Northern England. She graduated with a BA Design from the John Cass School of Art. Based at Wimbledon Studios. Nikolai Bojadziev [Facebook/Twitter/Instagram] - I can't find a thing about him, but what the programme told us. He's a collage artist from Bulgaria. 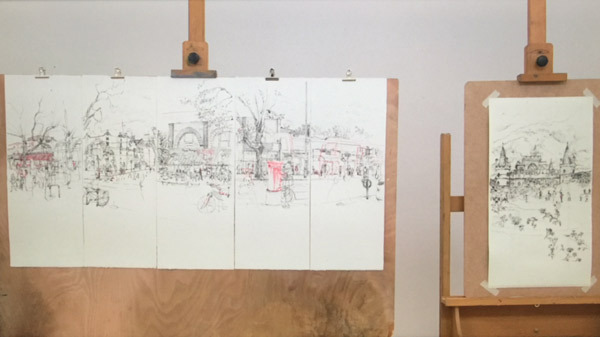 Andrew Halliday [Facebook/Twitter/Instagram] - studied at Bournville Schoolof Art before graduating with a BA honours degree from Wimbledon School of Art in 1991. Based in Barnes in South-West London and Lymington in Hampshire. Works as a framer in a gallery as well as being a professional artist. Tends to have a very colourful palette and likes artificial light. Allan Martin [Facebook/Twitter/Instagram] - Born in Scotland in1956. In 1978, left Glasgow School of Art with a Diploma of Art: Printed Textiles and a traveling scholarship. Worked as a graphic designer and moved to London in 1981. Had illustration and design clients in the music world. Also worked as a decorative paint specialist. Gave up his career as a graphic designer 8 years ago to dedicate himself to being a professional painter. This is his submission (I think). Sam Hencher - works as a visual effects artist (using Flame) working primarily on commercials and music videos. He's also an English painter and illustrator, born in Newcastle upon Tyne in 1971 who has exhibited at The Other Art Fair in London. I'm not quite sure why he rates himself as an amateur. Sam is emphatically NOT my definition of an amateur artist in terms of his standard of painting. My work is done in watercolour or oils depending on the subject. I like to paint both landscapes/cityscapes and figuratively and am more inspired by the light and mood of the subject than the physical element that is used to convey it. Nick Shaw - lives in Cumbria and works as a supermarket delivery driver. I couldn't find him online. 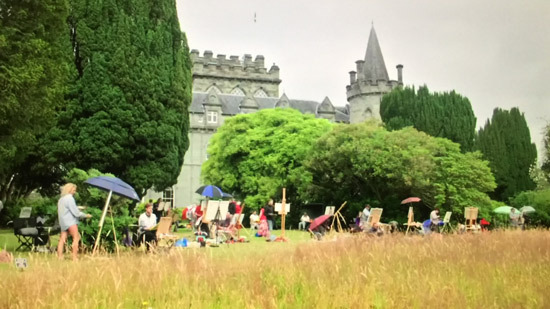 As ever there were also 50 Wildcard artists painting a view from a large flat area inbetween the castle and the river - and it was as crowded as ever! There have been some "know-it-alls" doing some online complaining about the quality of the paintings done by the wildcard artists. 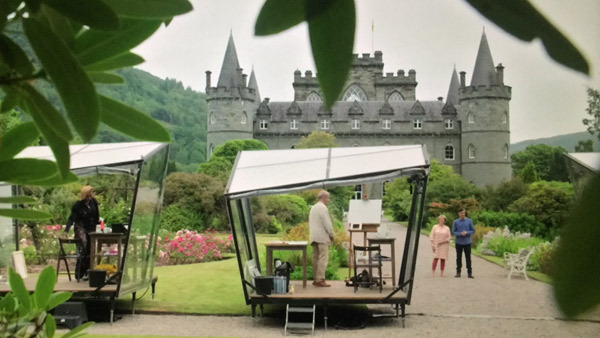 For my part I really think such people either know nothing or forget that plein air painting as part of a Wildcard entry is a completely different proposition to choosing your spot when you only have yourself to please while plein air painting. A more accurate term might be "cheek by jowl" painting! Driech for the uninitiated is the Scottish adjective used to describe the dreary and bleak associated with a lack of sunlight - and very flat light. Often associated with and going hand in hand with that other well known word beginning with d - drizzle! The thing about flat light is you can see colour so much better. As a child I remember we always used to go out when it was raining to see what we could see - i.e see more clearly that which was near invisible in the sun. Primroses in hedgerows were always a favourite - very clear to see - but still a soft yellow shade which was true to their real colour! 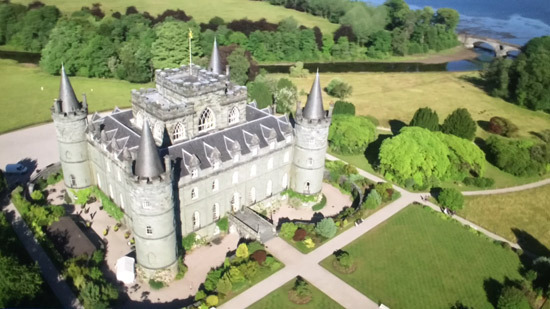 Disney is how one might describe Inveraray Castle with its Fairy Princess Turrets and scope for playing up the pictorially picturesque and Magical Kingdom aspects. I think they were interested to see whether anybody painted the concept of the castle as opposed to its reality. Imagination versus reality - and what that did for the colour. Stephen also obviously loves colour and has a full-on ("turned up to 11") approach to the use of bright colours. He painted the castle - starting with a purple outline and working up to a totally soft jade green castle. It was interesting. Allan on the other hand has a very sombre and dark monochromatic approach to painting. Basically it's black and grey - and I don't even think white gets a look in! He didn't change his practice at all - except for choosing a smaller support to accommodate the need to finish in four hours. 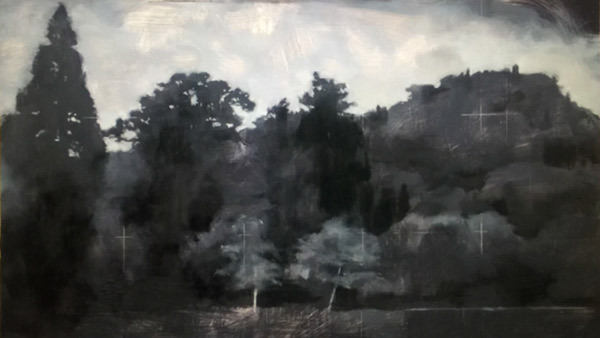 TIP: In terms of very flat light and absolutely no shadows or highlights, this is a common experience for those who regularly paint plein air and obviously it pays to be experienced in producing paintings in flat light and not to be just a 'fair weather' painter who is wholly dependent for shape and form on having sunlight and shadows. TIP: My recommendation for anybody chosen for a pod is to ponder a while on why YOU have been chosen for this particular heat. 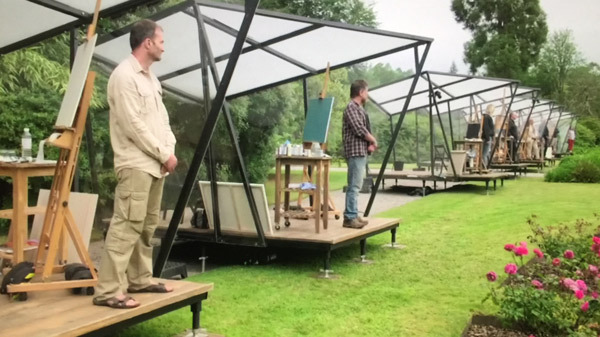 Why did those putting the programme together think your paintings might be interesting in this particular content. How to stand out from the crowd - and avoid painting 'the obvious'! Just because you're sat or stood in front of 'a castle', you don't have to paint 'a castle' - as the winning painting demonstrated. 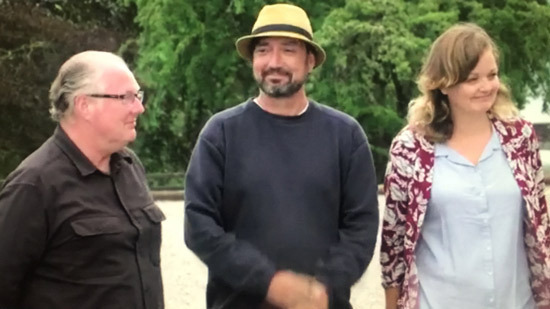 Remember the little chat between Stephen and Tai about "painting the obvious"? If there is an obvious subject - and you paint it - then you naturally start being ranked amongst those who painted the "whatever" and which will be compared directly one with another. 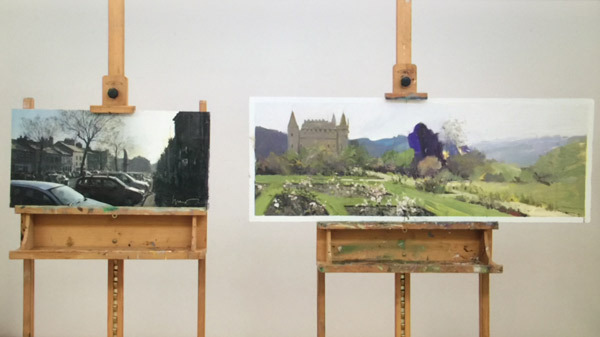 Whereas if you paint the place - but leave out the obvious (or all of the obvious) - then your painting is judged on its merits alone and less in terms of whether your castle is better or worse than somebody else's castle. EITHER how can you paint a place - and leave out the obvious. OR how you can paint the obvious but create a painting which is unique and not like anybody else's. one which completely ignored the castle and went for the real heritage - the watch tower on the top of the hill. TIP: A detailed painting of the "obvious" dominant feature - the castle - did NOT feature in the shortlist. It's worth remembering should you ever get into a pod! Or just paint in an area where everybody has painted before. This is one for realists and those who think it's important to include all the details. Watch Allan's use of a T Square hooked over the horizontal crossbar above his support - which he then slid left and right - backwards and forwards. He's seems to use it very much in the same way other painters use a mahl stick. What's innovative about this for me is I've never seen one used like this by somebody working plein air. There again Allan has never worked plein air before either! I did try using "How to use a T Square when painting plein air" but came up with zero relevant responses! Sam Hencher - I loved his painting in terms of format, composition, colour and brushwork I'm guessing a visual effects artist is used to working with a panoramic letterbox format. Allan Martin - for somebody who said at the beginning of the heat that he'd never ever painted outside before he did a pretty good job. I thought there was a certain amount of sleight of hand going on as it's clear he had an image on his iPad - and had squared up his support - and although, it looked as if he was working from life it seems likely there was quite a bit at the beginning which involved the translation of a photograph to the support. What struck me was the total consistency of style between submission and heat painting. When you see that you know that the artist has 'found their style' and has the capacity to continue to create in a consistent fashion in the future. TIP: It's always my very strong recommendation to enter competitions like this only after you have "hit your groove" as it were. The Judge's comments were detailed and dense - delivered quite quickly do I've reproduced them below for those who missed them the first time round. Kate "This isn't just a great piece because we know it was produced by a typewriter. Her composition is very intelligent and it's got so much sense of intrigue. It's got a real sense of a living landscape." Tai "What's most impressive is the vegetation. How do you make vegetation - which is kind of an abstract organic thing - with typewritten characters and symbols? Kathleen: "There's a real richness and you've got this elegant combination of almost abstraction and real detail so somehow it's got an impressionistic feel to it - and real energy"
Kate "Allan made a genius decision not to depict the castle - and what he's come up with is this really unusual way of showing us landscape, utterly devoid of colour, sense of time of day, place and it's still so evocative"
Kathleen: "and yet it's still so really real. These slightly paler trees at the front and the way the light is coming through the trees in the background gives you that sense of perspective. I think it's one of those paintings that you can spend quite a long time with. " The winner of Episode 5 was Allan Martin. In terms of an impressive combination of paintings, he is a worthy winner. I'm no great fan of 'black paintings' and variations thereon - but his technique is arresting. It occurred to me that one of the reasons for choosing him was the subject of the commission at the end of the competition. 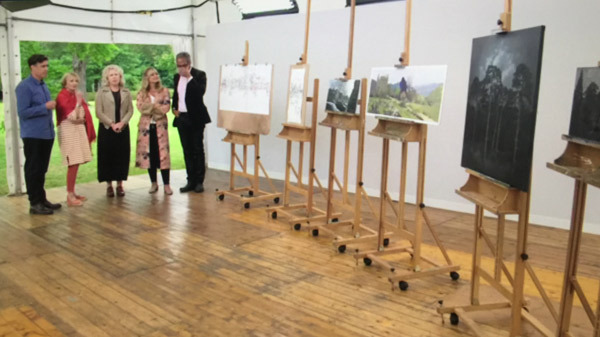 The Imperial War Museum have commissioned a painting of a forgotten battlefield - which from the evidence to date in terms of film at the beginning of the programme - involves a lot of trees. However I have to confess my personal preference would have been Sam Hensha (however his surname is spelt) - because of his abilities with respect to outstanding composition, and the handling of both tone and colour in very different light. Notwithstanding I am totally in awe of what Keira Rathbone creates with her typewriter! The Wildcard Winner was Penny Overton [Facebook]. The Judges liked the composition and thought she had caught the view with the red bushes in the foreground rather well. Penny lives and works in Warwickshire and is fascinated by where the land meets the sky and the water. She paints mainly in acrylic on canvas with the addition of pastel, sand and metallic leaf. I liked her brush work in the trees in the background. The semi-final is next week - when ALL the Heat Winners and just one of the Wildcard Artists from the pool of Heat Winners will paint Felixstowe Docks. 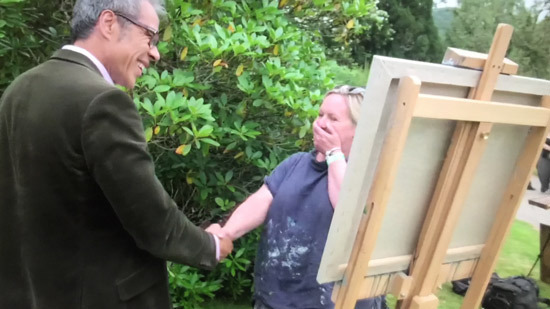 Then the following week it will be the Final and after that the programme about the painting created by the winner.